Next up is a simple recipe which will show you how to cook a nice pasta dish on a one-ring stove. You can follow this method for all pasta dishes. This dish uses only oil as the sauce. 150g Pork (choose this cut of meat: 돈육항정살/ don yuk hang jeong sal ), cut into smaller pieces. Cut the meat with scissors or a sharp knife and add to the bowl with a little oil and ½ of the seasonings. Add a tiny bit of oil and mix all the food together by hand. When the water is boiling, add the pasta with 1 tbsp oil and boil for 1 minute less than the package directions. You want the pasta to be al dente (almost done). Heat a large frying pan on medium-high heat for 1 minute and then add 2 tbsp oil. Let it heat for 30 seconds. Add the remaining seasonings and cook for around 30 seconds, stirring frequently to avoid burning. Add the vegetable-pork mixture and stir fry until the vegetables have slightly browned and the meat is cooked the whole way through. 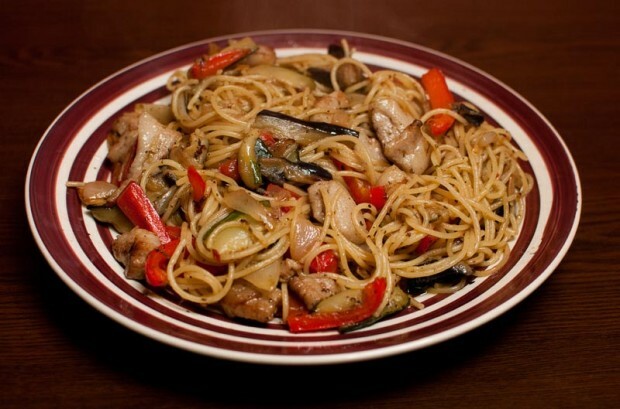 Add the cooked pasta to the frying pan and coat with the vegetables, meat and oil for 1 to 2 minutes. Remove with tongs and eat! *Boiling the water can take a long time – with the pot I used it took a good 20 minutes if not longer to bring to the boil before I added the pasta. Tip: Use a lot of water. Pasta should be cooked in a lot of water, but not everyone has a large enough pot here. Choose your largest one and as much water as possible. If needed, break the pasta in half. Filed under: The Main Dish, What's Cooking?